Musical Extravaganza – A once in a lifetime experience, in aid of Cancer Council Queensland and Ganesha Temple, South Maclean. 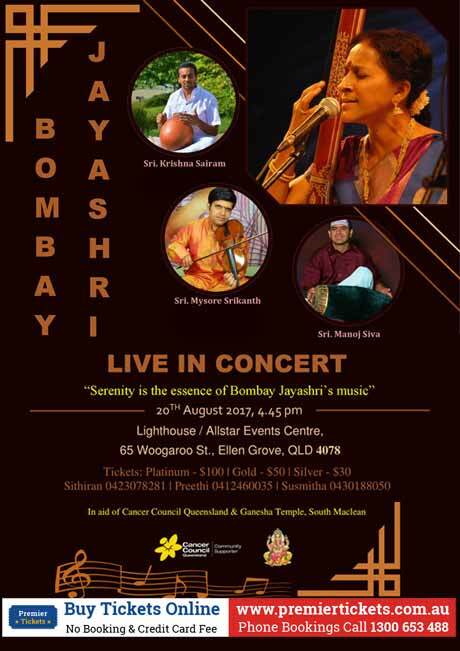 Bombay Jayashri Ramnath is one of South India’s foremost classical singers. With rare expertise in blending various styles with creativity whilst maintaining an uncompromising adherence to classical forms, Jayashri’s concert is a must for all music lovers. Having worked with great maestros of the field across music, dance, fusion, film and theatre she has won several awards. Classical singer Bombay Jayashree has been nominated for Oscars for the best original song for her lullaby in Life of Pi. The song has been written, composed and sung by Jayashree for the Canadian composer Mychael Danna, who scored the music for the film.